Originally the gardens surrounding the house and then the nursery were for the personal pleasure of Pat and Bob. 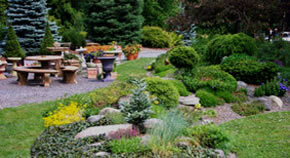 Over time they have evolved into complicated gardens that incorporate all types of plants and many experimental varieties where new annuals and perennials are tested to see if they are really garden-worthy and hardy for the area. They also found that their customers started to wander around the gardens because it gave them visual insight on how plants work together or how plants will look when they are full-grown. Our gardens over the years, have really become so popular our regular customers will bring their visiting friends and relatives over just to see the gardens that change with the seasons. This is fine with us. It gives people confidence in our abilities when they see what we have achieved on our property. 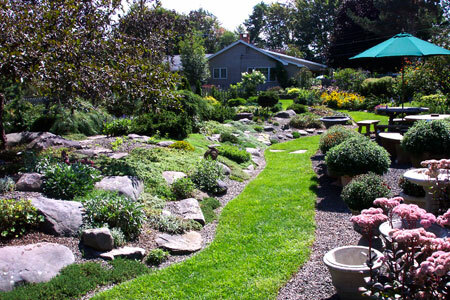 They see that there is potential to create their own beautiful gardens in the mountain top environment. “The success of the nursery,” Bob says, “is very much based on Pat’s artistic ability to create an environment for her customers and to make every arrangement with her personal sense of aesthetics using color and form.